Imagine, for a moment, a place where you can look absolutely anywhere--north, south, east, west, up, down--zoomed in or zoomed out--no matter where you looked, you would see amazing, eye-popping views. Such a place is so amazing, so spectacular, so unforgettable, that it was named Paradise--because it is. 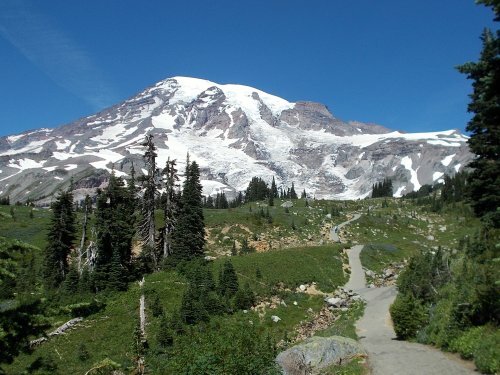 Then imagine some idiot, looking at a map, designing a trail around a world-famous mountain known locally as Mount Rainier. 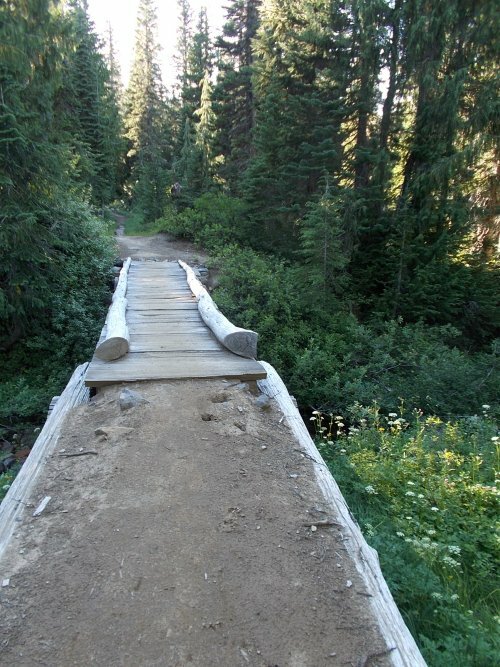 This was going to be a world-famous trail, and would pass through such incredible areas, that they would dare to name it the Wonderland Trail. And it is a wondrous trail--if anything, the name doesn't give the trail the credit it deserves. 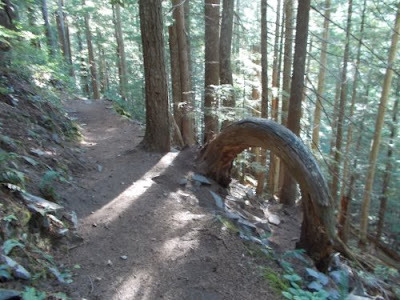 But--for some inexplicable reason--they didn't route this trail through Paradise?! WTF?! Seriously? How did that happen?! And that's how things stand right now. 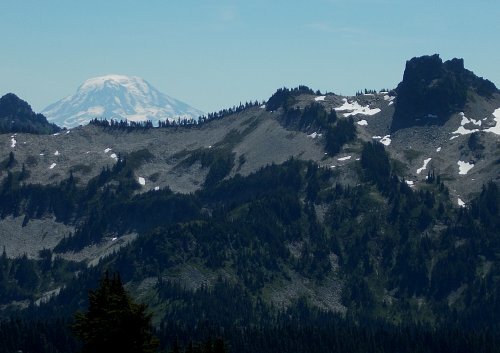 The Wonderland Trail, inexplicably, runs completely around Mount Rainier--completely around Paradise, in fact--but misses this Promised Land by a few miles keeping well to the south over some of the most boring parts of the entire Wonderland Trail. Now, when I say that the southern part of the Wonderland Trail is boring, it's a relative comparison. 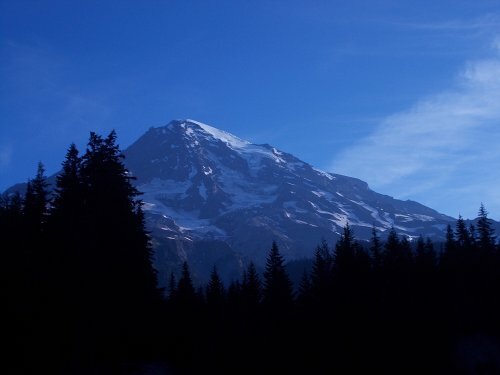 Kind of like calling Mount Rainier a mere hill--only because Mount Everest is twice as tall. But still, WTF?! 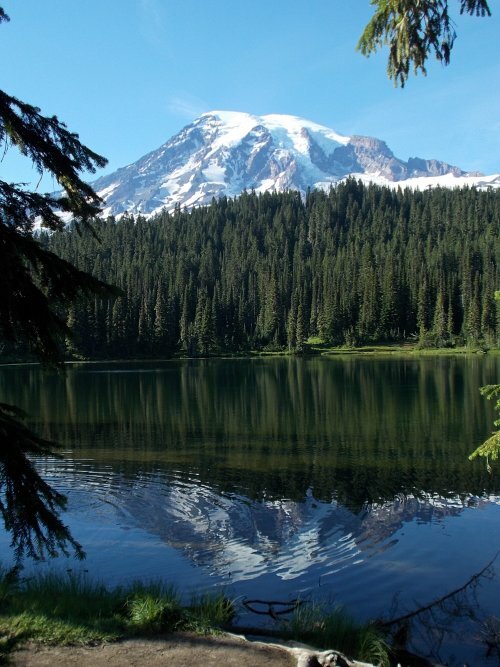 When I woke up this morning, I looked at my topo map and figured I had about 13 miles to reach my next campsite at Maple Creek--which is actually a bit short by my standards--and I wondered if I could lengthen my hike with a quick trip up to Paradise. There were trails that connected the Wonderland Trail to Paradise, and additional trails from Paradise that I could follow to reconnect to the Wonderland Trail--all without having to retrace my steps at any point. 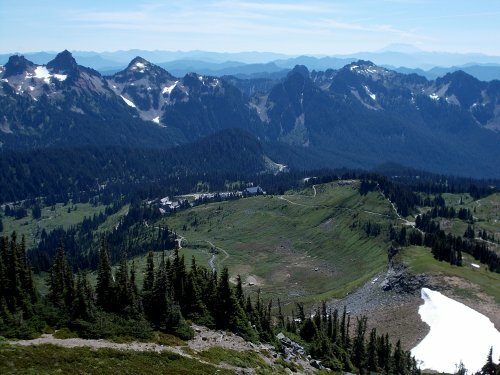 I'd end up missing about 1 or 2 miles of the Wonderland Trail, but I'd replace it with up to 8 miles of even better hiking opportunities near Paradise. It was an appealing detour.... Depending on the exact route I selected, I could add anywhere from about 4 to 8 miles to my hike from such a detour--which would mean my day's mileage would end up being anywhere from 17 to 21 miles. Not inconceivable... but definitely ambitious. I couldn't decide what I'd do that early in the morning, but I did notice another optional detour even closer to my current location. 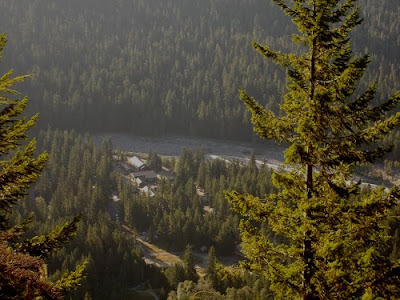 From the Pyramid Creek Camp, I could follow the Wonderland Trail down to Longmire or--I could get off the Wonderland Trail and follow the Rampart Ridge Trail down to Longmire which would add an extra mile of walking to my hike. I don't know anything about this Rampart Ridge Trail except that it's one mile longer and that I'd never once stepped foot anywhere on the trail. I had followed the Wonderland Trail section the last time I did the Wonderland Trail, and I honestly couldn't remember anything particularly noteworthy about those 1.8 miles. Oh, sure, maybe it had a couple of nice views--even a very nice view could be forgotten after eight years compared to all the eye-popping, jaw-dropping views it had to compete with. 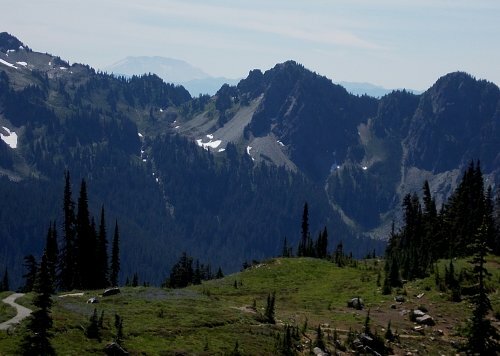 So I found myself drawn to the Rampart Ridge Trail--the trail I'd never set foot on before. And heck, it was just one extra mile. Why not? 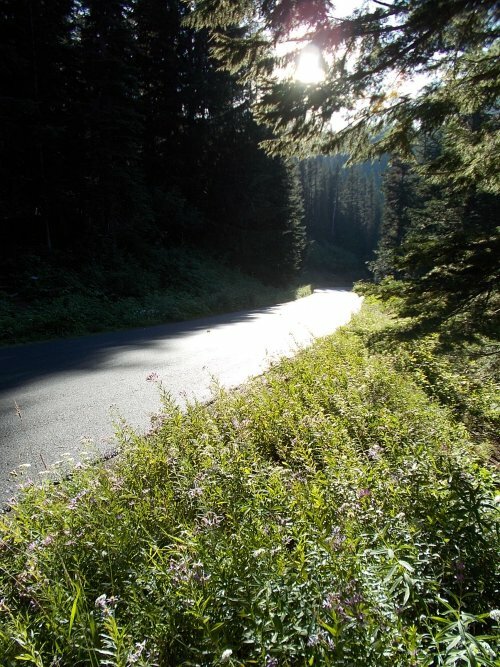 By the time I reached Longmire, I had decided that I definitely wanted to go up to Paradise. Exactly what route I would follow or how far out of my way I was willing to hike I hadn't decided, but I was definitely going up to Paradise. The day was absolutely clear and stunningly beautiful--if there was ever a day to be in Paradise, this was the day for it! I'd be a fool to miss it. 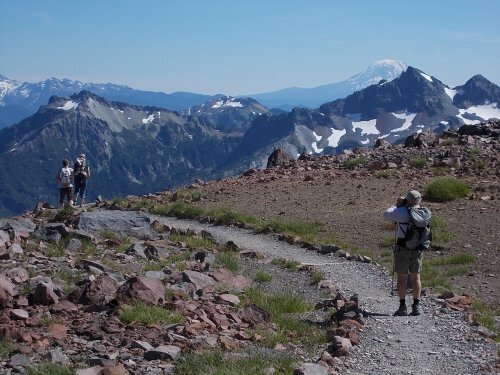 I'd already added one extra mile to my day's hike with the Rampart Ridge Trail, and I knew I couldn't linger at Longmire if I intended to hit Paradise too. It was still far too early for lunch anyhow--I ate breakfast barely two hours earlier. Paradise would be a good place to stop for lunch and decide what I'd do from there. that kind of impressed me. What the heck happened to that tree?! 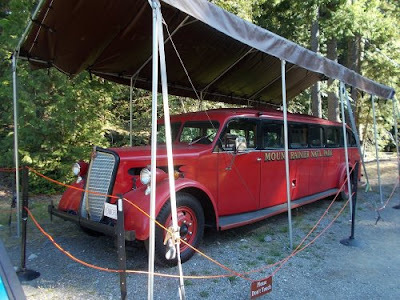 I walked through Longmire, took photos of all the various historic buildings, threw the trash I had saved over the last three days in the trash can, and headed back onto the Wonderland Trail. 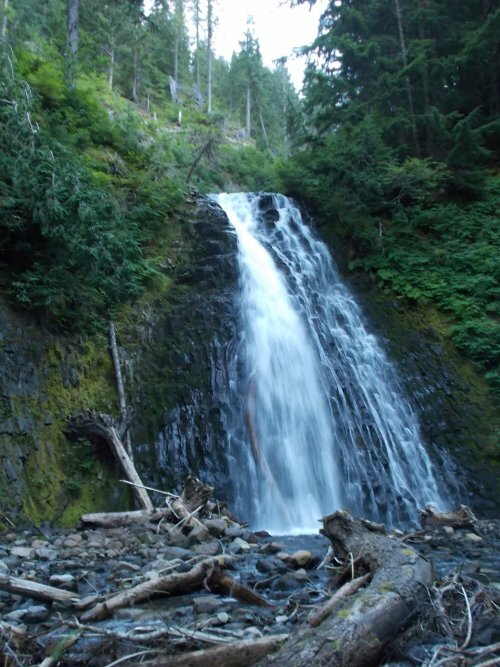 Another four or five mostly unmemorable miles later, the Wonderland intersected with the Narada Falls Trails and I was officially off the Wonderland headed up to Paradise. I didn't really expect much from this connector trail--I was only following it to get up to Paradise, but it turned out to be the nicest section of trail I had hiked all morning. 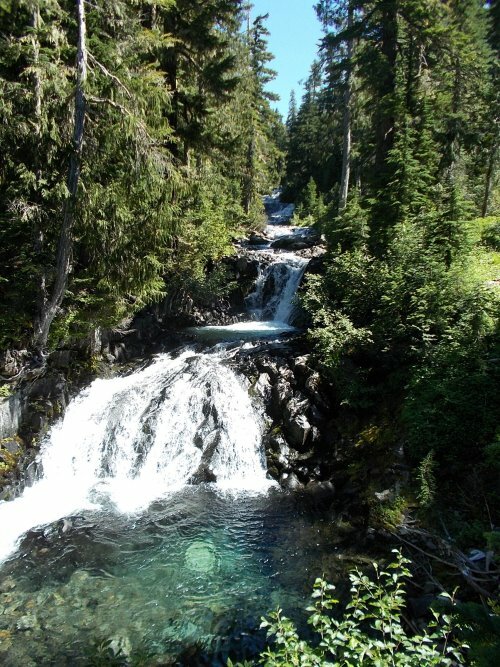 It passed Narada Falls immediately--a wonderful little waterfall right off the Wonderland--then followed the Paradise River up a series of very scenic cascading falls almost the entire way to Paradise. 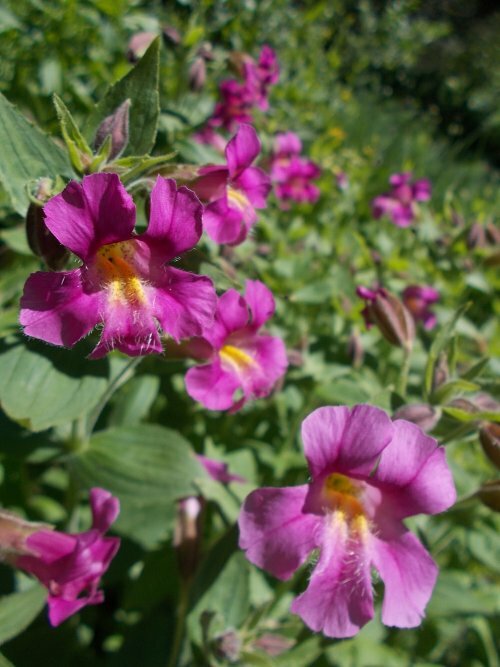 As the trail neared Paradise, the trees gave way to small fields of wildflowers lining the river. Wonderful! But I also knew that there was a lot more to Paradise than parking lots. I would continue onward! I sat down on a bench in the shade and ate some of the food in my pack for lunch. 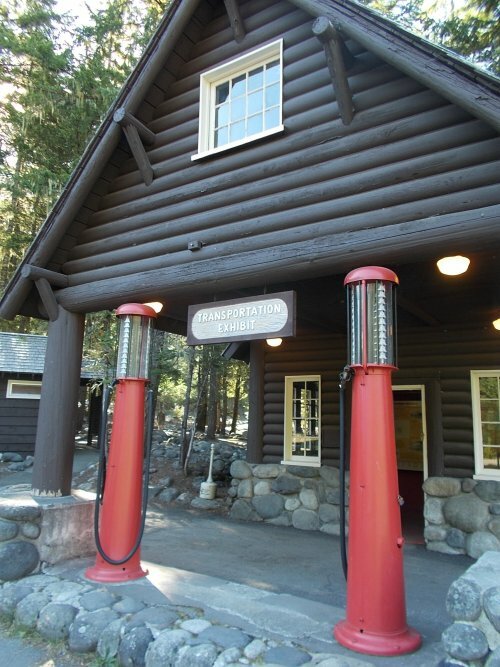 There was a cafeteria in the visitor center, and I was sorely tempted to make use of it, but the line inside was rather long and, by golly, my pack weighed too darned much already. I really wanted to lighten the load by eating my own food. Inside, I picked up a map of the Paradise-area trails which were far more detailed than anything I currently carried. I also bought a few postcards and used the payphone to update Amanda and my mom with my progress. 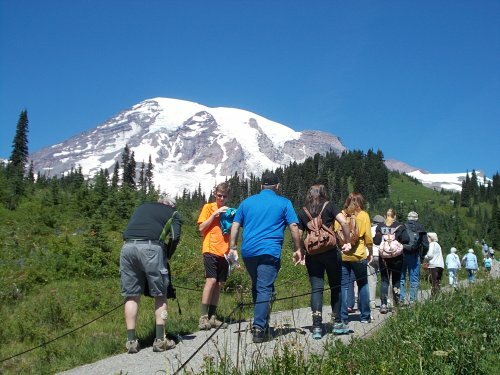 The trail immediately coming out from the visitor center was a positive highway of people which felt nearly as claustrophobic to me as the tree-infested campsites of the Wonderland Trail. I also felt more than a little out of place with my giant pack while everyone else carried small day packs and still managed to look clean and even smell clean. But the views.... wow, the views! They just kept getting better the higher I went. In the distance, I could see Mount Adams pushing itself in our face. Mount St. Helens was more subdued but clearly visible. 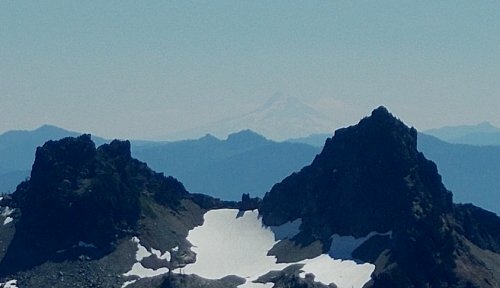 Mount Hood was barely discernible in the distance, but it too was visible more than a hundred miles to the south in an entirely different state. It was also the first I noticed a wildfire burning far off on the horizon. 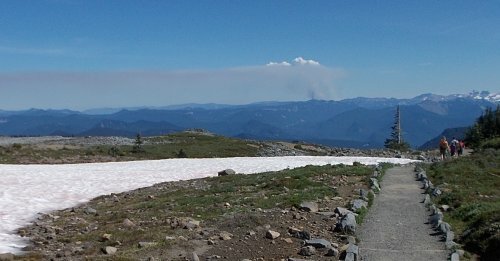 I didn't know where it was burning, how the fire started, or how long it had been burning, but the smoke that stretched across the horizon was clear--there was a wildfire burning and with some gusto! 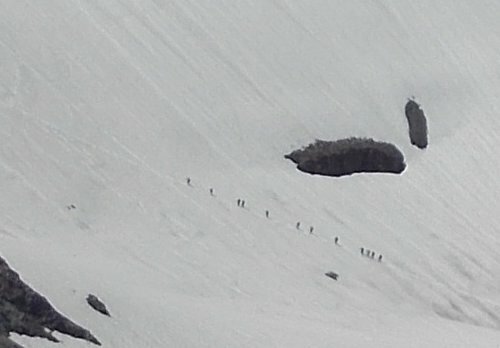 The other hikers thinned out the higher up the mountain I went, but there were still an astonishing number of them. Too many, in my opinion. Not just because I don't like large crowds, but damaged meadows from people who didn't stay on the trail were everywhere. It was a sad site to see--bare ground from the tromp of feet that had no business being off the trail in the first place. Signs everywhere warned people to stay on the marked trails, but I saw plenty of people flouting those rules. 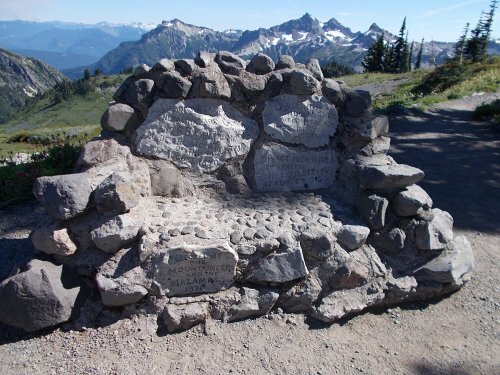 One sign warned that you could be fined $50 for straying off trail, and I didn't think the fine was harsh enough--the meadows were a disgrace. 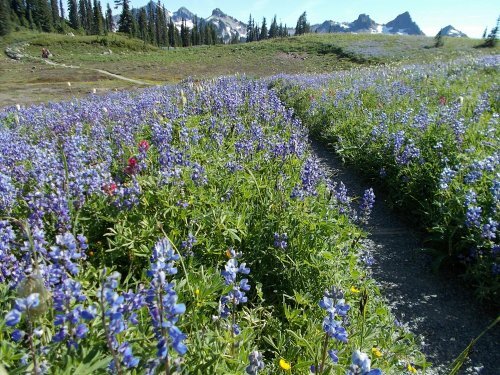 Oh, they were still incredible compared to almost anywhere else you'll ever see them, but the wildflowers had taken a bit hit at Paradise. Paradise was being loved to death. Compared to the rest of the Wonderland Trail, it was a poor showing. 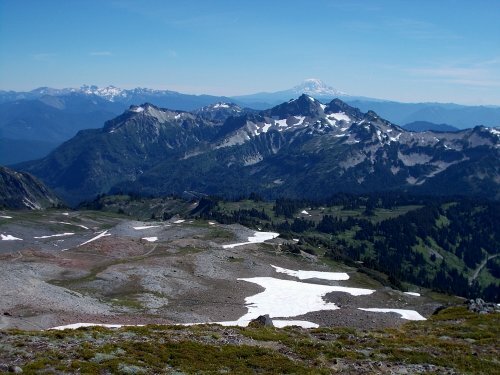 Now, I finally started understanding why the Wonderland Trail skipped Paradise. In a lot of ways, it had been ruined. And the atmosphere--with the hundreds and hundreds of people buzzing around--certainly didn't have the same remote, wilderness feel that you expect to find on the Wonderland. But damn! LOOK AT THE VIEWS!!!! They were still freakin' incredible!!!! Near the top of the Skyline Trail, the trail divided into the "High" Skyline Trail and the "regular" Skyline route, I suppose it could be called. 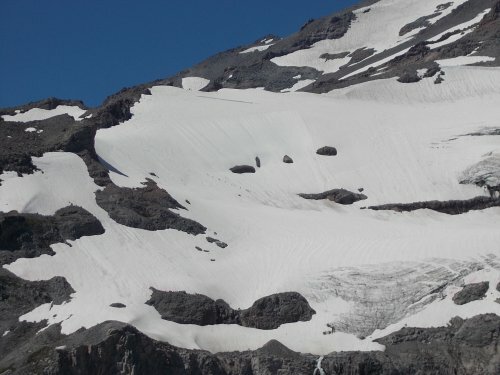 I had hiked this trail once before and remembered taking that regular route, still covered with snow, and getting halfway across it and thinking, "Wow, I better not slip here--I could seriously hurt myself if I slid out of control down this slope!" And there was still plenty of snow I could see on that route. Nope, I would definitely go around the long way. No snow for me--thanks, but no thanks! Two women on the trail ahead of me were trying to decide which direction to go, and I said they could die if they took the snow route. Okay, that was probably a slight exaggeration, but I did tell them I had done it before and I had absolutely no desire to ever do that again. 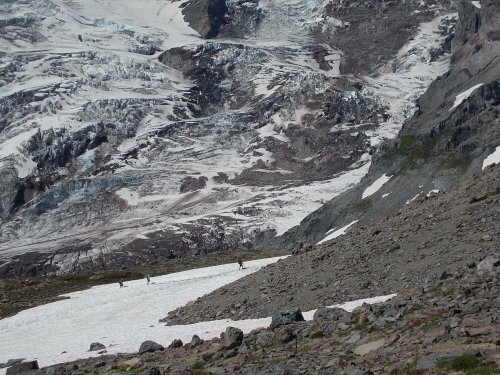 They still hemmed and hawed trying to decide what to do, and another woman coming down from the high route said that they could see the Muir Snowfield and Muir Camp from the high route which you can't see from the low route, and the two women immediately exclaimed, "Oh! Wow! We'll definitely do the high route!" I couldn't help but laugh. Out loud. "Really?" I asked them. "I say you could DIE on the low route, but that didn't convince you--but a view of Muir Camp did?" Eventually, I hit the top of the Skyline Trail and was quite relieved to finally be going back downhill again. I was exhausted from my uphill climb! And the downhill trek was a heck of a lot faster. Eventually, I left the Skyline Trail for the Lakes Trail at which point the stream of day hikers thinned out considerably. The day hikers only seemed to be interested in areas above the parking lots of Paradise--they weren't interested in the areas below the parking lots towards the Wonderland Trail. I could follow the High Lakes Trail to the other end of the Lakes Trail to the Wonderland Trail and reach the same point after about 2 miles of hiking. Hmm.... 0.7 miles, or 2 miles...? At this point, I was a little tired. I did feel remarkably good considering the distances and terrain that I had covered and I was inclined to take the shorter route except..... I'd miss Reflection Lakes if I did the shorter option. 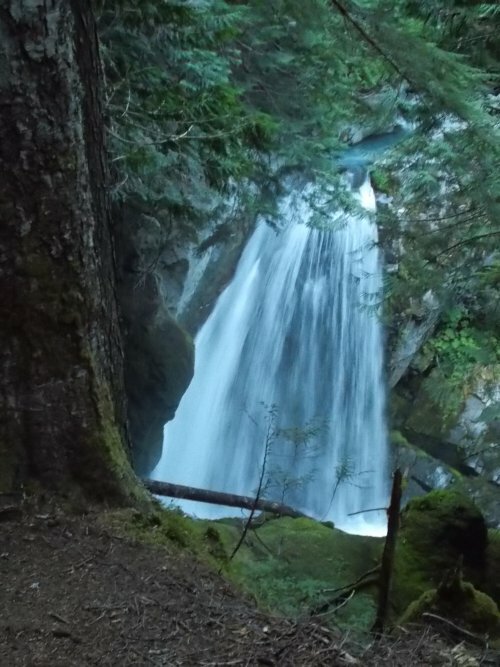 On my last thru-hike of the Wonderland Trail, that was the one place that really wowed me on the southern part of the trail. I really didn't want to miss Reflection Lakes. So it all came down to how much time did I have. Did I have time for that extra mile and a half (or so?) 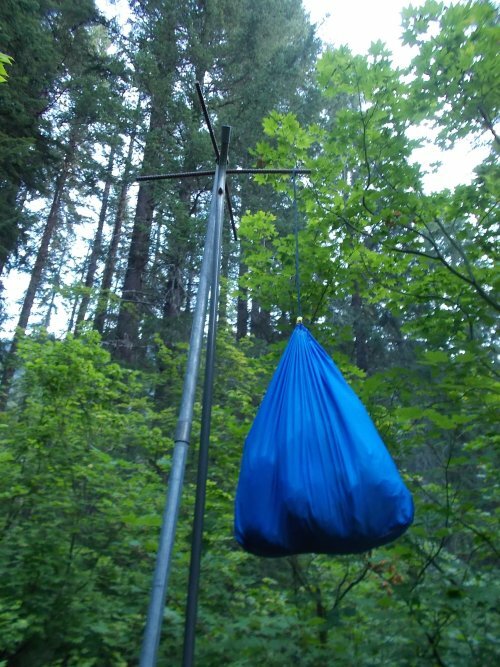 Could I still get to camp before dark? It would be almost entirely downhill from here on out which would help, and I decided that I could do it. The longer route it would be. Reflection Lakes was awesome--just like I remembered it. The only downside was that a road did go by it so quite a few day hikers were in the area, but nothing close to how bad it was at Paradise. I stopped for about 20 minutes to take another lunch break--a hiker needs his energy!--then picked up my pack and made tracks for Maple Creek. No more rests. No more stops. It was to Maple Creek, ASAP. but there is a rainbow at the bottom of the falls! I arrived.... technically, it wasn't officially sunset when I arrived, but the camp is located in a deep valley so on this part of the mountain, the sun was gone for the day. Not dark, but not exactly light either. I strolled into camp just after 7:00 and figured I'd likely be the last person to arrive. (I somehow doubted that any of the other campers had made the trek up to Paradise!) The campground had four individual campsites. Site #1 was occupied, so I continued to site #2, which was also occupied. Then to site #3 which, not surprisingly, was occupied. Then I headed up to camp #4 and noticed that it was at the edge of the trees--the last campsite wasn't in the claustrophobic trees!!! I was ecstatic! How did the best campsite not get taken?! Then I noticed the tent in campsite #4 and my mood plummeted. I grumbled to myself, "Why the hell did I ever bother to get a permit for?" 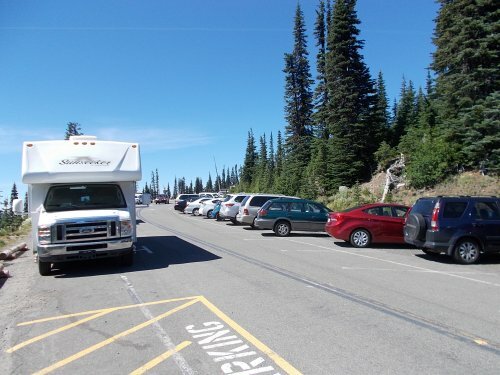 This was now the second time I arrived at camp to find all of the campsites already full. Plus the one night when I did get a campsite, but still shared it with Scott who didn't have a permit for that campground. Not that I minded sharing the site with Scott--he seemed like a nice fellow and at least asked if he could share the site. But good grief! 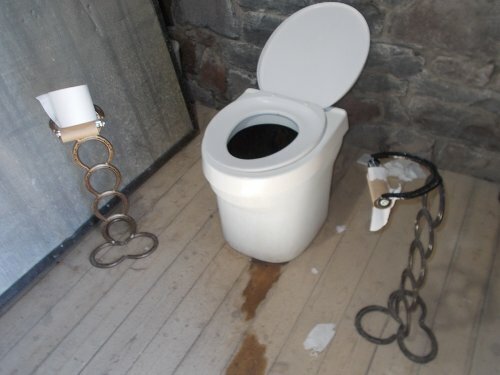 It was my sixth night on the trail and three of the times now I've had problems! I turned around, angry, wondering where I was going to camp now. I'd already hiked over 20 miles through some very steep and strenuous terrain and I sure as heck had no intention of hiking any further. I was done! And now I was pissed! I headed back to the campground entrance then followed the signs to the group site which, I was pleased to find, was completely empty. I supposed there was still a slim possibility a group of hikers could arrive at any minute who were scheduled to camp at the group site, but it was already after 7:00. That seemed very unlikely. I was going to sleep in the group site. Or just throw in a couple of bucks if you're happy with just a chance to win my book. =) Come on! It's a good cause and time is running out! Who knew? 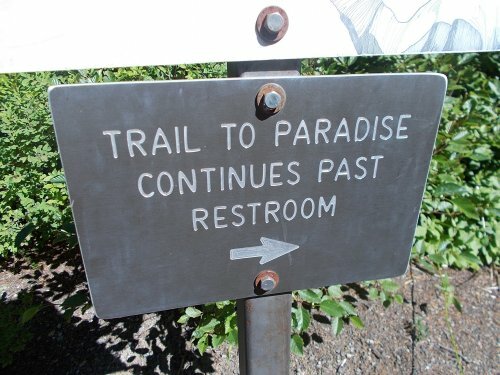 All this time, I never imagined that the road to paradise led past the restrooms. 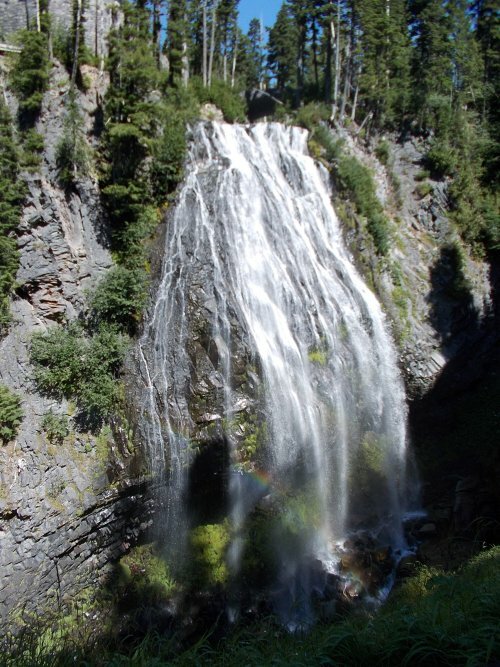 The Narada Falls Trail followed along a long series of cascading waterfalls. Which is a pleasant surprise since I had no idea these falls even existed! I had to beat a path through the crowds at the trailhead! Mount Adams in the distance! 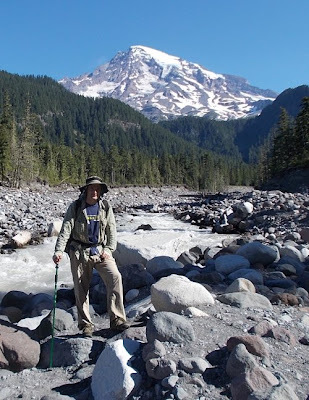 Mount Hood was barely on the threshold of seeing. 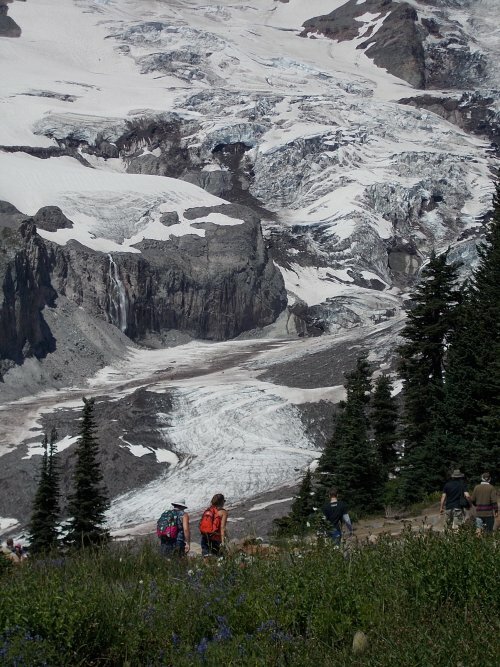 Hikers in front of the Nisqually Glacier. Yes! Those are climbers out here! Hikers (see those tiny little dots!) in front of the massive Nisqually Glacier. 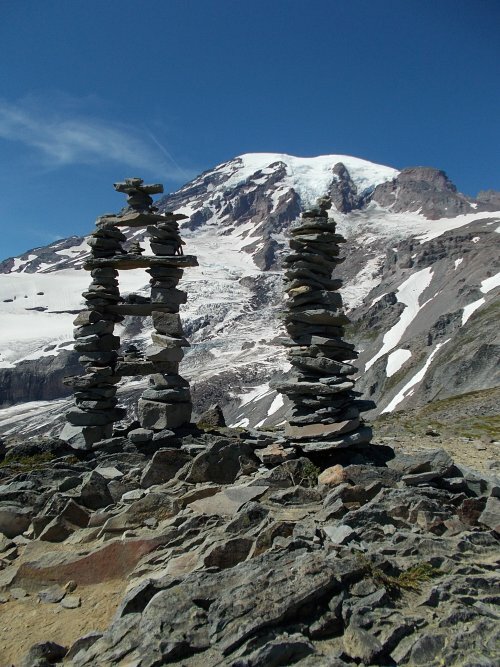 I gotta say--these are some of the most impressive cairns I've ever seen. They're taller than I am! that snow-covered area in the distance on the left. Good grief! Couldn't you find just a few more flowers to add to this photo? Reflection Lake--and we're finally back on the Wonderland Trail again! 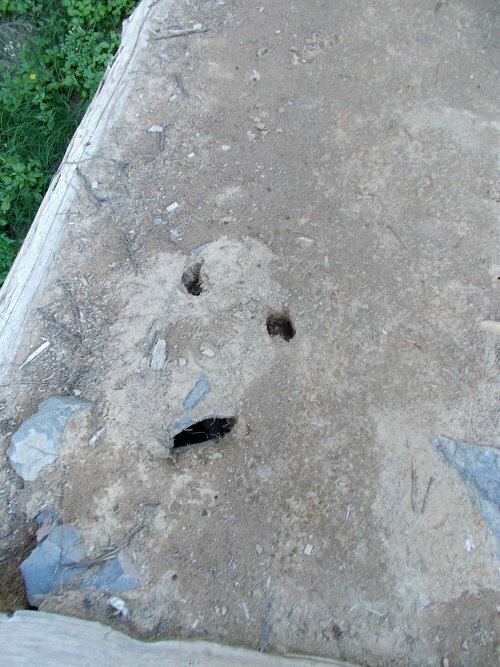 but I swear I can see a face looking out at me, and he doesn't look very happy! on the right side of the trail? That's where the Man in the Trail was hidden.